The wreckage of Chevret-Vaissade Park. 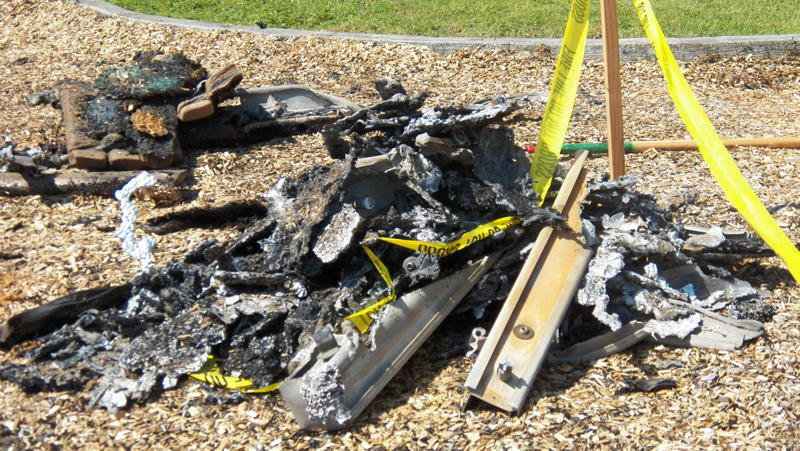 ARCATA – In the aftermath of the September 3, 2011, fire that destroyed the Chevret-Vaissade Park playground, the City of Arcata offered a $1,000 reward for information about the arsonist. Local attorney Kathleen Bryson generously donated an additional $500 to the reward fund. Two citizens came forward with information critical to the investigation that led to the arrest and conviction of three juveniles responsible for setting the fire. The City is giving out the reward this week to the two confidential witnesses who will each receive $750. In the weeks following the playground fire, neighbors, local businesses and non-profit organizations donated almost $4,000 in cash, pledged additional matching funds and made in-kind equipment contributions. Thanks to this outpouring of community support, the playground’s insurance deductible was paid and the City was able to replace the playground equipment in record time. An enthusiastically attended ribbon cutting ceremony was held at the rebuilt playground on October 27, less than two months after the fire. The story of this community-wide effort is documented in a short video, “Chevret-Vaissade Park: Tragedy to Triumph” at arcata.granicus.com/MediaPlayer.php?view_id=6&clip_id=1075. This entry was posted on Thursday, March 15th, 2012 at 12:49 pm	and is filed under News. You can follow any responses to this entry through the RSS 2.0 feed.